If a deeper tone with virtually no high pitch rasp is what you're after on your 2015 V8 Mustang, ARH has the answer with our Pure Thunder Catback Muffler System. 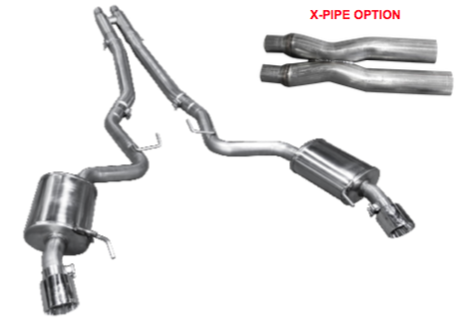 With the ability to handle tremendous power, our 100% US made mufflers are all 304 S/S and feature our 4" polished double walled tips that are fully adjustable. This allows you to position the tips for the exact appearance you want. Comes standard with our 3" H-Pipe or optional 3" X-Pipe.